﻿ On Feb 19, 2012 the Taipei Customs Office seized 889 grams of Amphetamine from an inbound passenger. The drug was concealed under the man’s shoe pads. On Feb 19, 2012 the Taipei Customs Office seized 889 grams of Amphetamine from an inbound passenger. 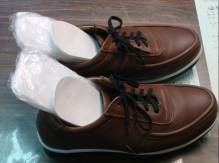 The drug was concealed under the man’s shoe pads.